Tropical Far North Queensland... beautiful one day... perfect the next. 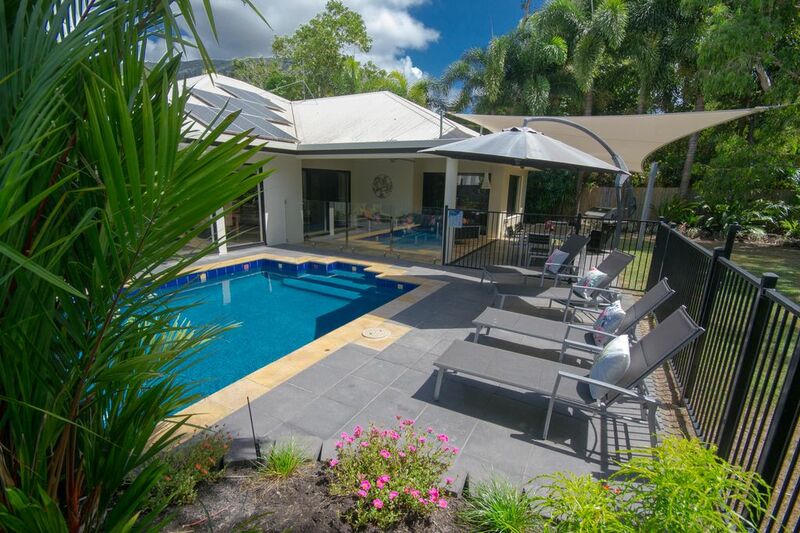 'Villa Blue,' a luxury fully self-contained, three bedroom home located at Cairns premier beach, Palm Cove. Set in tranquil surrounds, the property's backdrop is a beautiful Melaleuca forest whilst being only 400 meters to the beach, jetty, restaurants, luxurious day spa facilities and golf course. Sit back and relax by your very own private, saltwater pool which is heated in winter , making the perfect place to unwind after a day in the tropics. There are no crowds here! Put on some music, pour a glass of wine, and luxuriate in the double spa bath. Other features include: fully air-conditioned with ceiling fans throughout, Smart 3D TV with 3D Blue Ray player & soundbar surround sound plus unlimited Wi-Fi internet. The large outdoor entertainment area includes outside couches & chairs, 8 seating alfresco dining & barbecue to cook up a feast of local seafood & produce. We have thought of everything, including books, board games, DVD's, CD's, videos, a toy box for the kids, and complimentary premium sparkling wine to welcome you on arrival. Here in Tropical North Queensland we are fortunate enough to have two world-heritage-listed treasures. The pristine Great Barrier Reef Marine Park wonderland with its breathtakingly beautiful corals and marine life, and on-shore, some of the world's most unspoiled intact Wet Tropics Rainforest. The Cairns CBD itself, the entry point for all these attractions, has no beach, but fortunately, just to the north there are several; but none so precious, so pretty, so perfect as Palm Cove. This beautiful beachside village is perfectly positioned for you to enjoy all of the regions assets. All the comforts of home are to be found within easy reach of your holiday accommodation at 'Villa Blue,' including luxurious day spa facilities, hairdressing salons, beauty care services, water sports hire, day care services for children, post office, car hire, drug store, and mini marts. Discover world-class dining, taste the finest seafoods and delicious tropical fruits. Snorkel or dive on the Great Barrier Reef. There is also fishing, sailing, bungee jumping, white-water rafting, Skyrail rainforest cableway, Kuranda scenic train, Tjapukai Aboriginal Cultural Park, and much, much more.Or simply relax by a freshwater rainforest swimming hole, at the beach, or even in your own, private, saltwater pool which is heated in winter for year round enjoyment. Do as much or as little as you like. FOR THE GOLFERS: Palm Cove Country Club is situated only a few hundred meters from 'Villa Blue' and is set in lush tropical gardens. Alternatively, Paradise Palms Golf Course (a few minutes away) is a world-renowned championship course (AGU rating of 76) and has one of the most striking clubhouses anywhere. Location, location, location !! Private forest backdrop but 5 mins walk to all the main attractions in Palm Cove - beach, Jetty, Golf , restaurants, spas & children's playgrounds. Undercover patio with comfortable outdoor Sofa & armchairs. Small step at front & back doors, otherwise all flat & open plan.